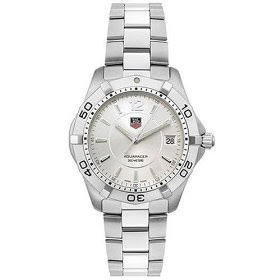 Amazon.com is having a TAG Heuer sale. While several watches are at a 30-50% discount, the personal favorite I saw was the Men's Silver Aquaracer Watch model number WAF1112.BA0801. This watch usually retails for $1400, but Amazon has it discounted by 38% making it $869.00. This is the kind of watch that would never go out of style. It is classic silver throughout. The face of the watch is scratch resistant sapphire crystal. The watch has precise Swiss ETA quartz movement. You'll find it water resistant up to 300 meters (984 feet). The watch has luminescent hands, markers, and a directional bezel. After 16 reviews on Amazon this watch still holds an overall 5 star review.